The grand arch and backdrop in the Guthrie Theater’s current production of Sunday in the Park with George. A sailboat and water from the source painting (see below, upper-left) appear on the right-hand side. Lighting design by Jane Cox, projection design by Caite Gevner, and scenic design by Jan Chambers. Photo by T Charles Erickson. The Guthrie Theater’s Sunday in the Park with George is a brilliant production that resonates strongly with contemporary discourses on art-making and criticism. 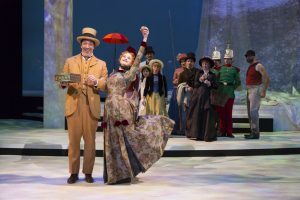 It is populated with a talented and engaging cast whose virtues will be expounded elsewhere; rather, this review will focus on the technical and design sides of this musical. Georges Seurat’s A Sunday Afternoon on the Island of La Grande Jatte, the painting whose creation inspired the Sondheim/Lapine musical. Elements of the painting are featured frequently in the projections by Caite Hevner. There are, to be sure, practical reasons feeding why some categories do not appear. 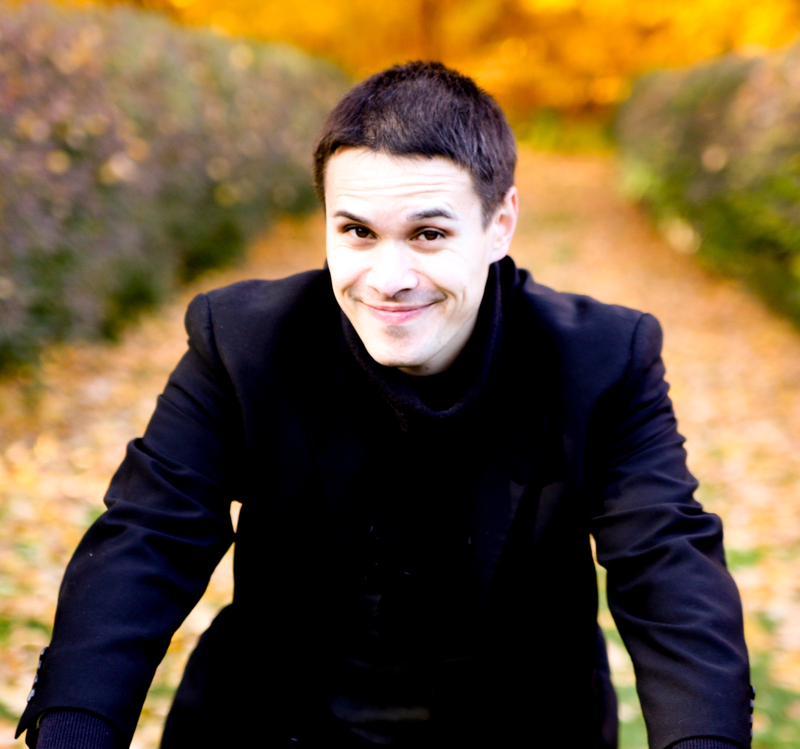 It is very difficult for a viewer to assess the individual contributions of a stage manager or dramaturge, for example, absent something going conspicuously wrong. Nor is it necessarily easy to untangle the work of a stage director from a musical director (“Best Director” usually refers to the former), or the cavalcade of other supporting creative staff. Nevertheless, however, a coverage gap persists. As NPR’s Jeff Lunden recently remarked, you can’t see stage managers – but you can’t do without them. So why not take a closer look? The Guthrie’s Sunday is a technically complex production whose visual and sonic designs evoke a painter’s mindscape and the myriad visual elements that coalesce into the final painting. Under stage manager Chris A. Code’s watch, a trio of trapdoors seamlessly transport actors and furniture onstage, with cues sliding in and out. Seemingly hundreds of light cues paint the stage with morning and afternoon hues in varied combination, with numerous gobos creating the effect of sunlight through the trees in a poignant recall of the pointillism painting technique discussed in the show. Jane Cox’s lighting design does far more than make the stage and show look pretty – it’s a vital element in allowing the audience to understand and sympathize with George and his obsession with light. The cast of the Guthrie Theater’s Sunday in the Park with George. The soldiers’ green period uniforms mark them as Jägers or riflemen – telegraphing to the audience that the two Celestes fall in love with low-ranking common soldiers. Costume design by Toni-Leslie James. Photo by T Charles Erickson. Another window into George’s psyche comes from the intertwined scenic design by Jan Chambers and projections by Caite Hevner. A massive fall of fabric becomes a massive tree trunk, a pillar, a swath of canvas, and a scattering of light. Projections on this fabric and the grand arch illustrate the sketches, studies, and elements of the final painting that are being discussed and sung about – a visual walkthrough that is highly compelling and removes an access barrier for those not strongly familiar with the painting. If you do happen to know this painting well, there are a visual Easter eggs, especially if you’re familiar with the studies for the painting. This speaks of a production strongly grounded in historical research; Rachel McGarry and Nicole Soukup from the Minneapolis Institute of Art have special acknowledgments in the program. Add in the distinctive period costumes by Toni-Leslie James and you have a compelling visual operetta from start to finish. Every production is the sum of many parts. 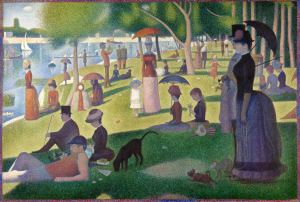 Sunday in the Park with George is a powerful show about an artist obsessed with creating a new way of painting founded on using tiny dots of paint side by side. In pointillism, when you step back, you see an entirely different set of details than you do up close. It’s the brilliance of those separate dots – and the different creative elements in this production – that makes it so vivid when you step back to watch. Take a glimpse at some of the backstage preparation for Sunday in the Park with George. Sunday in the Park with George plays through August 20 at the Guthrie Theater’s Wurtele Thrust Stage in Minneapolis, MN.